As an E.R. doctor, Cheyenne Allison is used to handling emergencies on a daily basis—until her own sister codes on the trauma bed. Devastated, Cheyenne retreats to an isolated farm in Hideaway, Missouri. But peace and solitude are in short supply in this picturesque Ozarks town. A dangerous vandal has the community terrorized, and Cheyenne finds an unexpected demand for her medical skills. Mayor Austin Barlow is convinced the culprit resides with Cheyenne's charismatic neighbor across the lake, Dane Gideon, whose ranch for foster boys has given rise to previous violence. Cheyenne distrusts Austin, while Dane inspires her respect, and perhaps something more—although she can't share the faith that sustains him as the violence turns deadly. 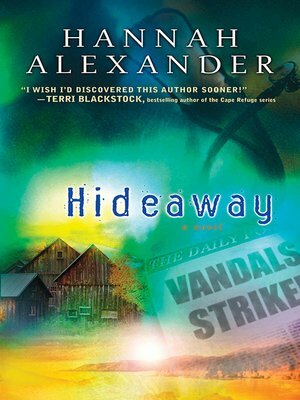 Then Cheyenne, already pursued by a past nemesis, becomes the vandal's target, and she can only hope that Hideaway will prove her sanctuary...and perhaps a place to call home.